"Under this mask, another mask. I will never be finished removing all these faces." Claude Cahun's photographic self-portraits present a dizzying kaleidoscopic mix of mystery, exuberance, and sobriety. Born in France, she lived most of her life on the island of Jersey with her stepsister and long-term love, Marcel Moore. Also known as Lucy Schwob and Suzanne Malherbe, both women adopted their preferred gender-neutral pseudonyms during early adulthood. Moore, although often invisible, was always present - typically taking the photographs and also authoring collages - and in this sense was as much artist collaborator as she was Cahun's personal support. Described in her own words as a "hunt", through a combination of text and imagery, Cahun's exploration of self is relentless and at times unsettling. From circus performer, clothed in layers of artifice, to a stripped-down Buddhist monk grounded by integrity, Cahun is engaged in an ongoing dialogue with multiplicity. Tragically in line with the fragmentary nature of her outlook, much of the artist's work was destroyed following her arrest and subsequent imprisonment for resistance against the Nazis. What remains bares interesting parallel to the title of Cahun's diaristic publication Aveux Non Avenus, translated as Disavowels, which enigmatically suggests that for all that is revealed and given, much is still hidden or has been lost. Themes of melancholy, futility, and uncertainty run deep through Cahun's career. She does not make 'complete' artworks but rather all of her photographs and writings combine to become part of a bigger and yet still unfinished whole. She says herself that she does not have the answers to her questions, and as such unusually makes visible the rawness, torment, and distress of not knowing. The introductory question of André Breton's novel Nadja (1928), 'Who Am I?' repeats with intense scrutiny, whilst collages made with Moore reveal the same love of symmetry and prismatic vision found in the book's illustrations. 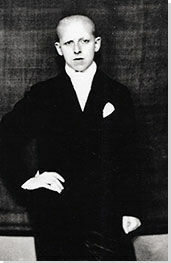 In general, Cahun shares an interest in certain motifs such as hair, hands, and animal familiars (for instance, her cat) with other female Surrealists, and similarly uses techniques of doubling and reflection to call into question fixed notions of gender and identity. Cahun's work looks forward to that of Francesca Woodman, Cindy Sherman, and Gillian Wearing. Influenced by Cahun's theatrical works, Sherman and Wearing both later explore the assumption of multiple 'masked' personas, recalling together Joan Rivière's classic paper on women who employ "womanliness as masquerade" (1929). Woodman however, followed on from Cahun's later, more organic, outdoor photographs. Entwined by seaweed, enveloped in vegetation, and submerged in water, both artists exquisitely combine eros and thanatos in the grand setting of nature. There is an obscurity surrounding Cahun that has made her an isolated figure. In character she was an obsessive loner, and yet she was also inextricable from Moore. From 1937 onwards, moving away from the artistic circles of Paris to the remote island of Jersey, the couple became somewhat awkward, ostracized, and inaccessible. Furthermore, with much of Cahun's work destroyed in 1944, the overall body of her production became relatively small further heightening her mystery. The original works that survive are very small, as though they have been left as clues for a much bigger treasure hunt. 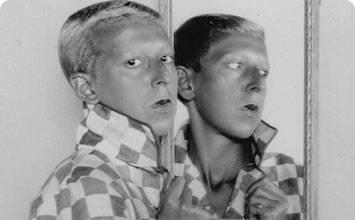 Claude Cahun was born as Lucy Schwob in Nantes, France, to a middle-class Jewish family in 1894. She later became Claude Cahun to appear gender neutral as an artist and as a writer. She had a brother, George, and her uncle, Marcel Schwob, was a well-known writer who was part of the Symbolist movement. Marcel Schwob was famous throughout Paris and became a good friend of Oscar Wilde. Cahun's grandfather, David Leon Cahun, was also an important intellectual figure from the Orientalist movement, and thus already in childhood the artist was immersed in a creative and intellectual environment. Interactive chart with Claude Cahun's main influences, and the people and ideas that the artist influenced in turn. First published on 25 Oct 2017. Updated and modified regularly.